The sixth book in the internationally bestselling Septimus Heap series by Angie Sage, featuring the funny and fantastic adventures of a wizard apprentice and his quest to become an ExtraOrdinary Wizard. In this sixth Magycal installment, Alther Mella has been Banished, a Darke Domaine engulfs the Castle, and a Darke dragon is on the loose. Septimus Heap must use all of his skills to save the Castle and the Wizard Tower from destruction: He must enter the Darke. But he cannot do this alone. With the help of Jenna, Alther Mella, Marcellus Pye, and Septimus's estranged brother, Simon Heap, Septimus and Marcia Overstrand battle the spreading Darkenesse. Will Septimus succeed in protecting his Magykal world? 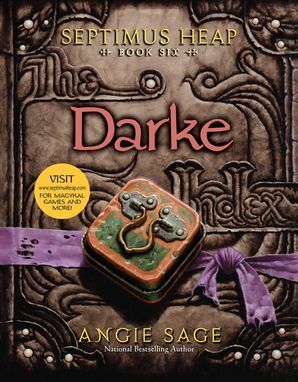 Written with Angie Sage's characteristic flair, Septimus Heap, Book Six: Darke is a compelling fantasy adventure filled with surprises, thrills, and laugh-out-loud moments. Readers will revel in the action-packed story as they realize the wisdom of Magyk—that all things are meant to be part of a living whole.